As SLPs, we read a lot of books about pirates because they say "ARRRRR" and that encourages our students to work on the "r" sound. There are a lot of books about male pirates, but not many with female pirates. Also, sometimes pirates use inappropriate language or actions in books and films. This is not the case with Penelope the Purple Pirate! 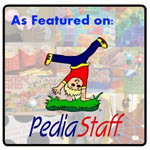 This children's book is a perfect treasure for your pirate library! In addition, it is not only available in book format but also on the iPad! 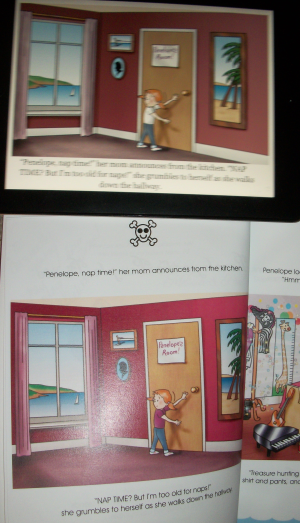 Continue reading for my review of this children's book and iPod/iPad application! 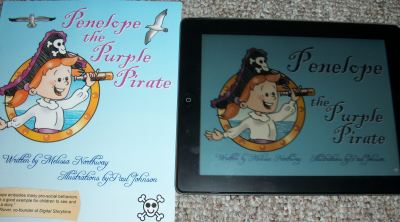 Take an adventure into a book and on the high seas with Penelope the Purple Pirate! The book starts with girl named Penelope who doesn't want to take a nap (and who does at that age?). Instead of taking a nap, she looks around her room and spies an adventure! She decides to hunt for treasure! So, with the help of her pirate hat and purple sash, as well as some animal friends, she takes off on an imaginative adventure on a pirate ship to find treasure! Along the way, she has lots of fun with her animal friends! This book is also available to download on the iPod/iPad as an application or an iBook. If you download it for $4.99 as an iBook, it will be added to your iBooks bookshelf and you must open it using the iBooks application. If you download it as an app, you are in for a special treat! You can change the settings by pressing the "i" button in the corner to either play audio and highlight words or not via on/off toggle switches. Audio is read by a female child narrator. In addition, there are interactive sound elements on the pages that you can find by pressing various objects on the screen. Penelope reminds me of myself as a child. Instead of going to sleep, I would stay up playing with my stuffed animals, reading, or writing by flashlight until I fell asleep. She is definitely somebody that young children can relate to. In addition, the story, dialogue, and the illustrations are very creative and pirate oriented such as the different animals having peg legs, hooks, and eye patches. This book and/or application would be a great addition to any teacher's pirate themed materials. I like this book/application a lot, but all of my reviews have suggestions for further updates. For the book, I noticed that it is covered in advertisements for the application and social media on the cover, first page, and at the end of the book when talking about pirate information. I don't mind a little bit of social media promotion on the back cover or on the last page of the book, but it feels a bit forced. I would love to see the social media on the last page and back cover rather than on the front cover, inside, end, and back cover. The application is great, but as I said with The Waterhole application, it seems a bit like a slideshow at times due to the way the pages move from one to the next. This is kind of a good thing due to the fact that it is not overcrowded with the words and sometimes the words move beneath the image instead of turning another whole page. However, at the end of the application, it is difficult to go back to the beginning. Also, the settings menu is difficult to find as it blends in the right hand corner. It would be easier if the book had the "read to me" and "read to myself" buttons like many of the other book applications and maybe another page for the information/questions about the book and animals. The ability to go back to the main menu from the last page would be nice as well. These are just little nit-picky things as the story, illustrations, and dialogue are what makes this a wonderful book! Articulation/Voice/Fluency - Have children read the book using appropriate speech sounds, fluent speech, and appropriate voice. Expressive Language - Children can create their own pirate story about another Penelope adventure or use their own stuffed animals to create an adventure story! Make sure they use a beginning, middle, and end. Also, children can write a sentence about something in the story using correct word order. Receptive Language - Have the child point to different objects and animals in the story. Children can also retell the story in order. Finally, use the questions at the end of the story and have children answer them. Vocabulary - There is information about dolphins, turtles, octopuses, and pirates at the end of the book. You can make a list of information about each, compare and contrast different animals, or create a graphic organizer about the characters. If you have both the book and the app like me, play the audio from the app and have students read along in the book. Another way to use both is to project the app on the screen and have students follow along or answer questions by looking back in the book! Have a pirate scavenger hunt in your classroom! This book is available on amazon.com for $9.95. It is available as a book on the iPod/iPad in iBooks for $4.99. It is available on the iPod/iPhone for $1.99 and the iPad for $2.99. 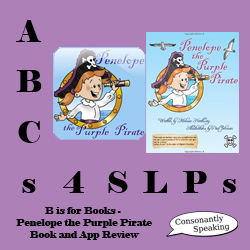 Consonantly Speaking won the Penelope the Purple Pirate book in a contest from The iMums and it was signed/sent by the author Melissa Northway. 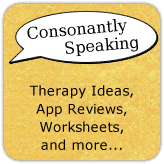 Consonantly Speaking was not asked to do a review of the book or application by The iMums or Melissa Northway or anyone else. No other form of compensation was received.